The 32-year-old Spaniard clinches his seventh ATP Challenger title. 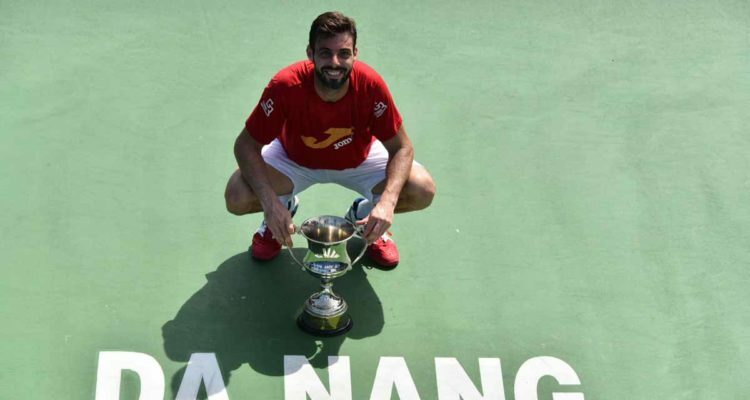 Top seed Marcel Granollers takes the singles title at the inaugural Vietnam Tennis Open Danang City 2019. The World No. 110 from Spain only needed 53 minutes to beat No. 2 seeded Italian Matteo Viola in Saturday’s final. Granollers sent down four aces and converted six of his 10 break point opportunities to secure his seventh ATP Challenger career title. The 32-year-old Barcelona native earns $7,200 in prize money as well as 80 ATP-Ranking points. Earlier in the day, Cheng-Peng Hsieh of Taipei and Christopher Rungkat from Indonesia lifted the doubles trophies. The No. 2 seeds battled past the tournament’s No. 1 combination of Indian veteran Leander Paes and Miguel Angel Reyes-Varela of Mexico 6-3, 2-6, 11-9. The final lasted one hour and 16 minutes. This entry was posted in ATP Challenger News, ATP Challenger Tour and tagged ATP Challenger, Marcel Granollers, Vietnam Tennis Open.